Garmin Forerunner: Beginner or Advanced Runner, Is It For You? We’ve been getting quite a few questions lately about our Garmin Forerunner 10 watches so we thought we would share a little bit of info with you so you can determine if this watch would fit your needs! First off, let me say that I knew very little about this watch. I received it as a birthday gift from my generous sister, who also has one. With that being said, I love my Garmin. It is very easy to use even for the least “techy” people. It only has 4 buttons to keep track of ( and one of them is the on/off button, so really only 3)! The Garmin Forerunner 10 will track the time of your run, will track your distance, calories burned, your running pace, and how long it took you to run each kilometer or mile ( depending on how you have yours set up). All this begins automatically with just the touch of one button! 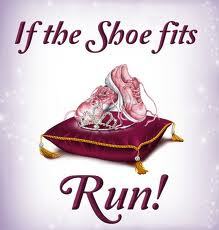 So say you are going out for a run. 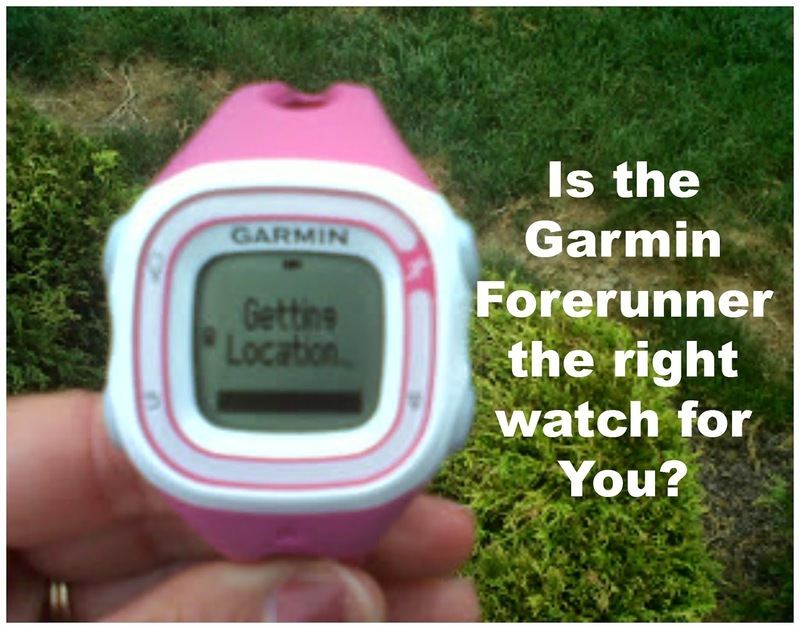 Grab the Garmin and turn it on. This isn’t like an everyday watch, it has an on/off button indicated by a light bulb icon. I’ve forgot to turn mine off several times and as a result my watch has gone dead mid run. 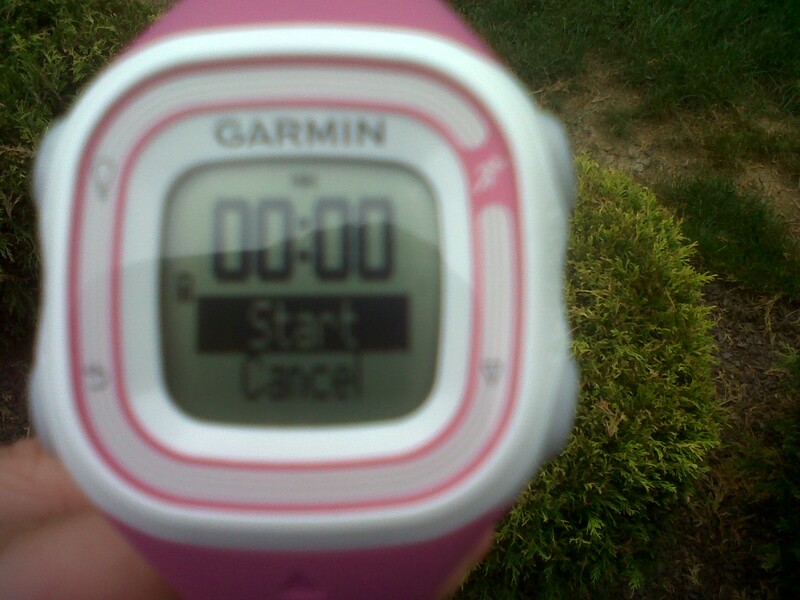 Once your watch is powered up, you will push the runner icon button ( this button is used as the “enter” button each time you want to make a selection). Your Garmin will then “Get a Location”. This is how it tracks your distance. Once a location has been loaded, pushing the runner button again will start your run. Everything I mentioned earlier, time, distance, pace, etc, will be tracked automatically. Pretty simple! Now if you want to customize your run, you have options for that as well. You can use the Run/Walk option. This is great for all those using the Galloway training method. You simply enter in how many minutes you want to run and how many you want to walk. When it’s time for you to walk, the watch will beep and at the end of the walk time it will beep again indicating that your run should start. I don’t use the run/walk method, but I sometimes use the Run/Walk option. I will set for a 3 minute run and 30 second walk. 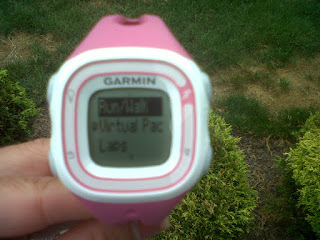 Instead of walking when the watch beeps, I use those 30 seconds to pick up my running pace. When the 30 seconds is over, I slow down to my normal running/jogging pace. Another option is Virtual Pacer. If you use this option, you will input the pace you want to run at. If you fall below the pace, or are exceeding the pace you’ve set, the watch will notify you with beeps. Other features include the Auto pause, which allows you to pause your run. Great to have if you run where you have to stop for traffic. My personal favorite is the Auto Lap feature. You can set your laps in kilometers or miles ( I use kilometers). Every time I complete a kilometer, that is considered one” lap” and I will hear a beep. The watch shows what “lap” I am on. If you set yours to miles, it will beep after every mile. 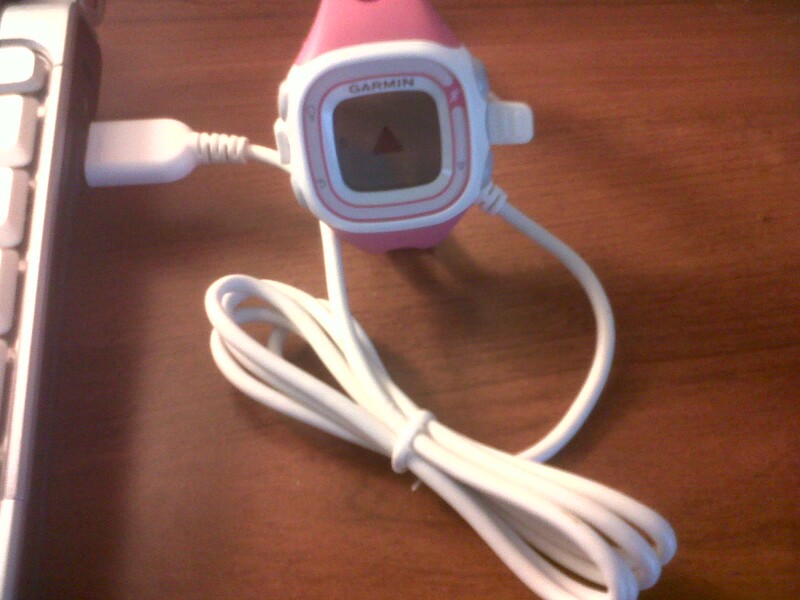 This watch comes with a USB cord and must be charged through your computer or other device. 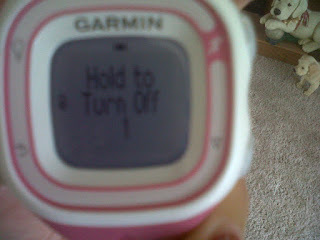 You also have the option of uploading your runs to Garminconnect.com. 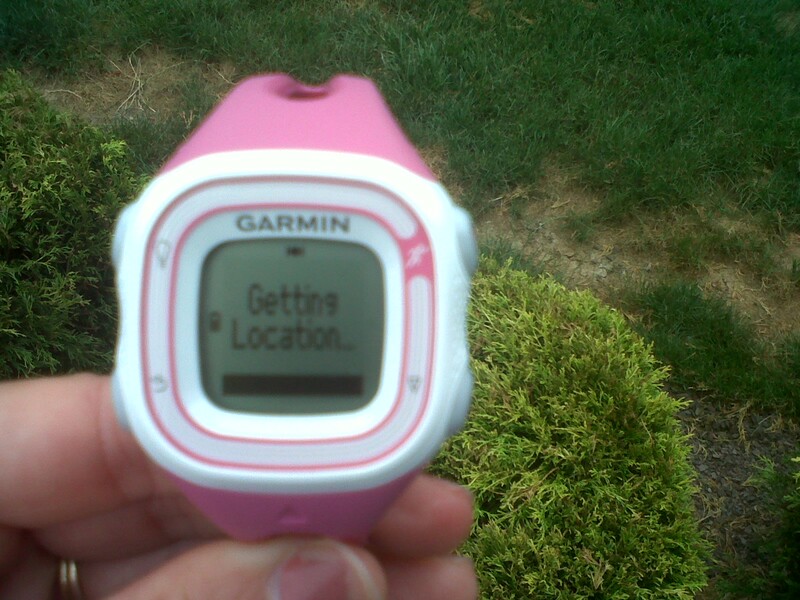 Here you can even “connect” with other runners using a Garmin. I know there are many other things you can do with this watch, but these are just the basics. 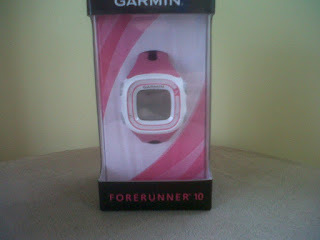 As of right now the Garmin Forerunner 10 comes in 3 colors, Pink ( which my sister and I both have), Lime Green ( which our mom has), and Black. Super simple watch that a beginner runner can use, but many cool options that an advanced runner wants. Just remember to power off when you are done! The only downside to this watch is that the battery life will only last 5 hours if it is kept in GPS mode the entire time. I have not experienced this yet as I have not been on a run longer than 5 hours. Do you have a watch that you use during training? Let's Talk About Your Running Route....This is what I've encountered! 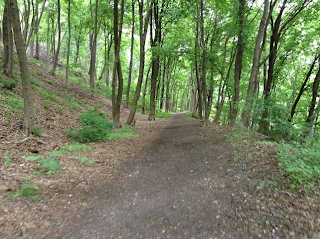 What do you look for in a running route? I hate running on roads with cars, stopping at red lights, and worrying about whether or not the sidewalks are even and if I will trip. Because of these facts, there are two running routes that have slowly become my favorites. 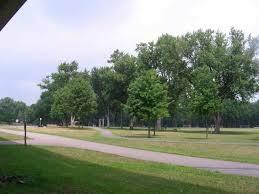 One of my favorite routes to run is a place called Island Park. This is literally an island surrounded by the river on all sides. There is a nice path, half paved, half gravel around the soccer fields and then a path that continues in a wooded area. This is one place that I make sure I have a partner with me when I run. I just don’t like the fact that it is so secluded. After this weekend’s run at Island Park, I now have another reason to not run there alone. I met my parents at Island Park around 7pm. No worries here as it was still completely day light! We did two laps around the entire island ( including the wooded trail). My GPS watch hadn’t hit my mileage goal yet so I continued to walk on the path near the soccer fields. My dad walked with me until my watch registered a 5K. As we said our good byes, I told him I was going to continue the path around the soccer field ( I needed to get in another mile for the Boston Remembrance Run that was closing out tonight). The path around the soccer fields is pretty open and it was still light out so I felt comfortable doing the lap alone (and there were other cars in the parking area, so I knew there were still people in the park somewhere) My dad walked back to the car, and I continued down the path. When I got to the curve in the path, I remember saying “O My God” outloud! I just stood there, I didn’t know what to do. There was a deer in my path. I figured that it was more afraid of me than I was of it. (Isn’t that usually the saying?) I figured as soon as it spotted me that it would run away. That was clearly not the case. That deer was literally staring me down. I thought about just continuing on my way, but I was afraid that if I ran past it, that it would follow after me. I decided to take a step up on the grass near the soccer field ( away from the deer) and at that time the deer hissed/snorted and went up on its hind legs. Yes, I was a frightened now! It pranced over to the side of the wooded area but did not go in the woods. It still had its eyes on me. I took a little short cut through the soccer fields and ran back to my car. I figured I could do another lap but modify the route a little. I grabbed my phone just in case I saw anymore deer I could take a picture. By the time I got back up on the path my GPS watch had gone dead. I used this as a sign that it was time for me to just go home. I went home and did my last .78 miles on the treadmill! I’ve told this deer story to a few people this weekend and it still shocks me each time I tell it. It was not an “Ahh, I saw( from a far) a beautiful deer along my run” it was a “OMG, I have encountered a deer”. And that is just one more reason why no one should run alone! 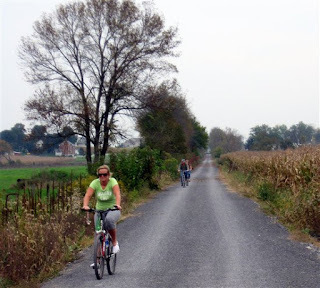 My other favorite route is a rail trail which is a running/biking trail through a farming community. The positives of this trail are that it is completely flat, and no worries of cars, red lights, or crooked sidewalks. It’s a popular trail, so I feel comfortable even when I have to run it by myself. The downside is that a lot of the trail is open field so there is little shade in most areas, and there are no water stops. I use to worry about wild animals coming out on the trail, but so far I’ve only had to dodge bunnies, chipmunks, the occasional cat, and once had to jump over a gardener snake. If I hadn’t been running at such a good pace, that snake may have flipped me out but I didn’t see it until I was practically on top of it so I just jumped over and kept going. 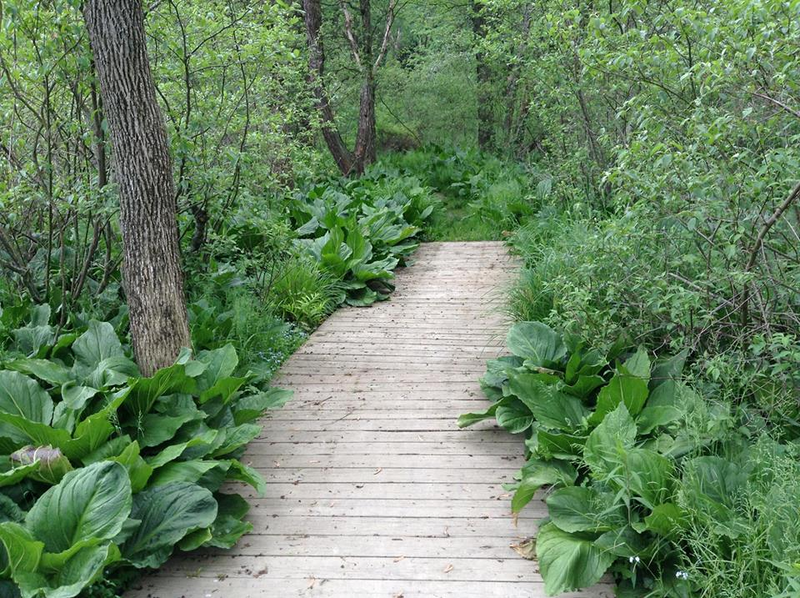 There are beautiful signs of nature along this trail too. I’ve seen the sunset a few times from this trail and this is also the trail were we saw the calf being born! 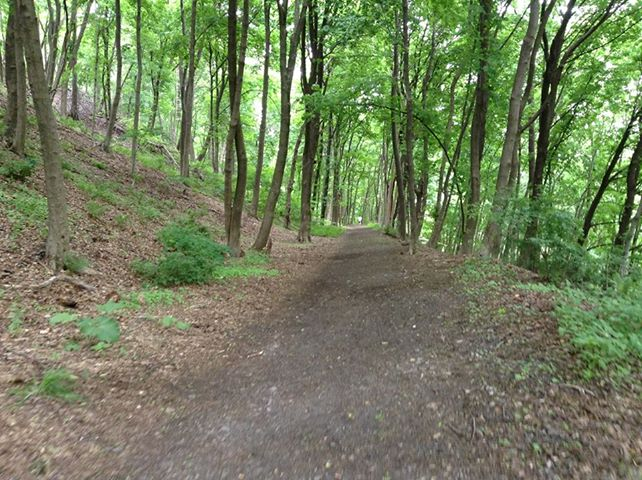 Do you have a favorite running route? If so, what makes the route your favorite? Earlier this week I saw a television commercial for $15 compression pants at Old Navy. 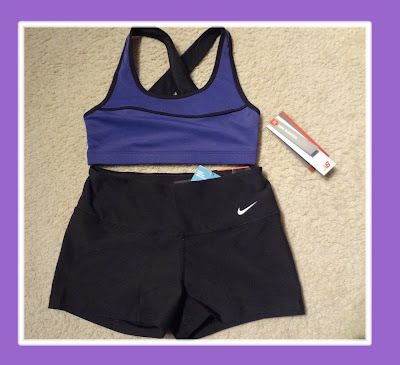 It never crossed my mind to look at Old Navy for workout/running clothes, but I was intrigued. Since the weather has been getting hotter and hotter here, I needed to get some cooler running outfits. So on one of my rest days this week, I decided to stop by Old Navy and check out what they had. I was pleased with the selection. For every pair of shorts or pants, there were a variety of shirts in similar colors that matched. ( I do like my running clothes to match so I look somewhat put together). They had longer tanks, blousy tanks, cropped tanks and sports bras. I normally am not a huge fan of Old Navy Clothing but because they were having such good sales, I thought I would give them a try. Here is what I decided on. 3 pair of Compression sock on sale for $3.90 each. And although I won’t be wearing them anytime soon in this heat, I did get those compression pants for $15 that were regularly $22.94. My mom even got a really great running outfit as well. When I was finished at Old Navy I continued to find great deals next door at Burlington. Here I found a purple New Balance top regularly priced at $23 for only $6.99. Nike dry fit shorts regularly priced at $42 for only $14.99. It may surprise you to know that I don’t really care for shopping and even more surprising that I don’t like shopping for clothes. But overall I feel I’ve had a successful shopping trip and am very pleased with my purchases. Does the change in weather have you shopping for different running clothes? So I wanted to do another activity besides running since it's been so hot out lately. 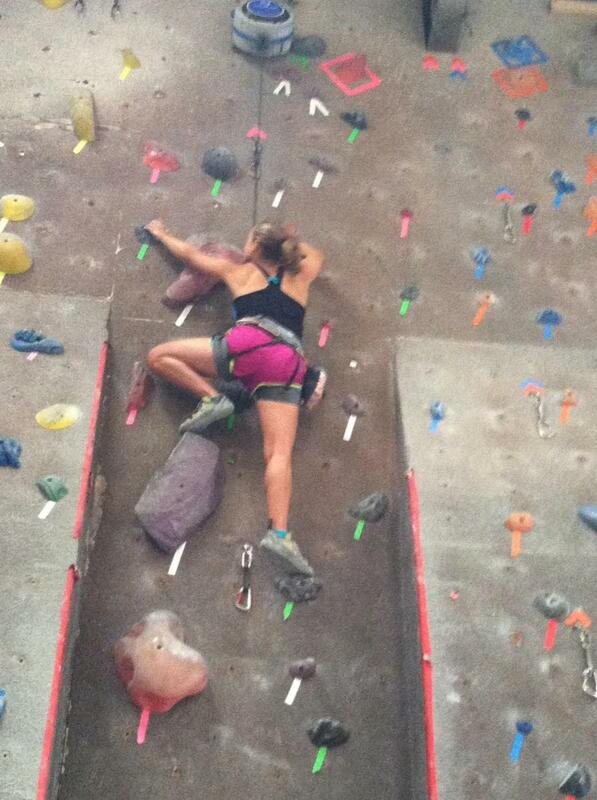 My friends are really big into rock climbing and are members at a local rock climbing gym. I thought I'd give it a try. I've only done it one other time and it wasn't at a gym. I didn't know what to expect. I remember last time that I was having trouble grabbing onto the rocks because my hands were so sweaty. 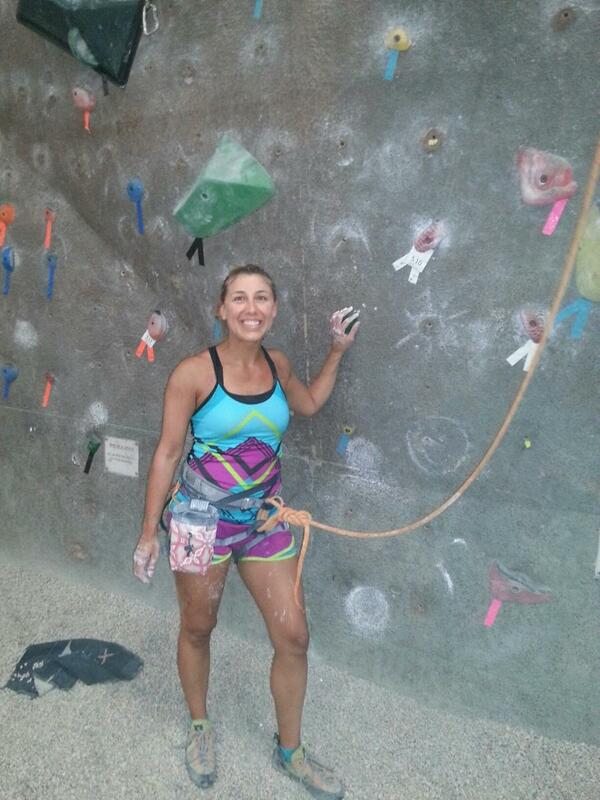 My friend reassured me that when you go to a rock climbing gym they have chalk to help with that. After arriving, my friend thoroughly explained how to tie the ropes and where the hooks went. I thought in the beginning there is alot involved with just climbing up a wall. When I've done it before, the instructor just straps you in and says ok you're ready. But this was different because you didn't have anyone looking after you. My friend is belayed qualified, which means she is able to be at the bottom of the wall with the rope connected to you to tighten the slack during your climb. In addition to that, I tried the auto-belay which is similar, but you do not need someone at the bottom. You rely on the hook that is attached to the floor instead of having someone holding the rope for you. This sounds like it may be harder or even a bit scarier not having someone there, but it actually was much easier. The walls that had the auto belay had bigger rocks that were easier to grab on to. The chalk really helped as well. Once getting to the top of the wall, all you have to do is push off with your feet and squat a bit so your knees do not scrape the rocks on the way down, and the belay will automatically lower you to the ground. The first couple of times it was hard to just let go, thinking that you would fall, but there was no way that would happen because the belay would catch you. I enjoyed trying a different activity. Being a runner, I don't pay as much attention to my upper body, but this is a great upper body workout, and you will definitely feel the burn afterwards. You have to push your body out of your comfort zone and try something new. What activities do you enjoy when it's too hot to run? We’ll be Rockin’ at Virginia Beach over Labor Day weekend! We are all signed up for the Rock n Roll Half Marathon series! Lacey will be running the entire half marathon again this year and Meranda and mom will be running the half marathon relay. This will be great practice for the Disney half marathon in February. After being spectators last year, Meranda and mom were considering doing the mini marathon for 2013, but when they found out about the Half Marathon relay, they decided to up their mileage! Rock N Roll weekend is always a great time. The fitness expo is Friday and Saturday ( last year we met contestants from the Biggest Loser and other great vendors. 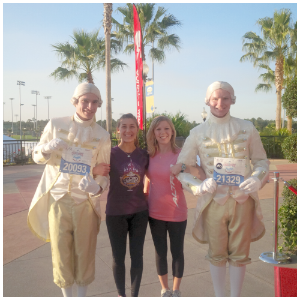 We hope to see Run Disney there again this year! ), and had constant entertainment on the beach with various bands. After the race we were treated to a VIP party by a very generous employee of Competitor Group and had great seats on the beach to see the band Train. Check out our weekend here. We are equally excited for Rock n Roll 2013 where the headline act will be Third Eye Blind. 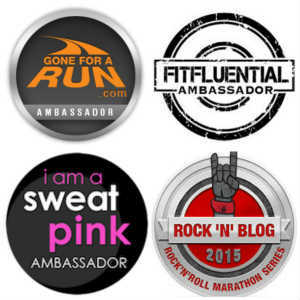 Have you run any of the Rock N Roll Series Races or have you ever done a half marathon relay? 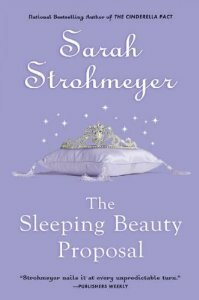 After reading The Cinderella Pact by Sarah Strohmeyer, I continued the fairytale and picked up The Sleeping Beauty proposal by the same author. Are you a person who goes after what you want or do you sit back and hope that good things happen to you? The protagonist in this novel, Geanie Michaels has been known to do the later hence earning her the title of Sleeping Beauty. She finally “wakes up” and starts to take control of her life when she realizes that her prince charming boyfriend has just proposed on national television, but it wasn’t to her. Geanie’s friends and family hear of the proposal second hand and naturally think that it was meant for her and start planning a celebration. Part of Geanie wants to come clean in spite of the embarrassment the false proposal has caused and the other part of her wants to go along with the fairytale. Of course it was the title and the fancy purple cover that drew me to this book, but I certainly was not disappointed in the story. New- to –me author Sarah Strohmeyer tells great stories about modern day woman who’s struggles may be tales as old as time! Add this fairytale to your list of summer reads and you won’t be disappointed! Have you read any other books by this author? Tonight I went to the screening of Spirit of the Marathon II ( Rome). Before I give you my thoughts on the movie, here is some background in case you hadn’t read up on the film. The film documented the journey of seven runners in the Rome Marathon. 7. A lady from California that set out to do 52 marathons in 52 weeks. I liked that Instead of seeing movie previews in the beginning, our knowledge of marathon trivia was tested. How young was the youngest marathon runner? How old was the oldest marathon runner? What was the fastest marathon time? 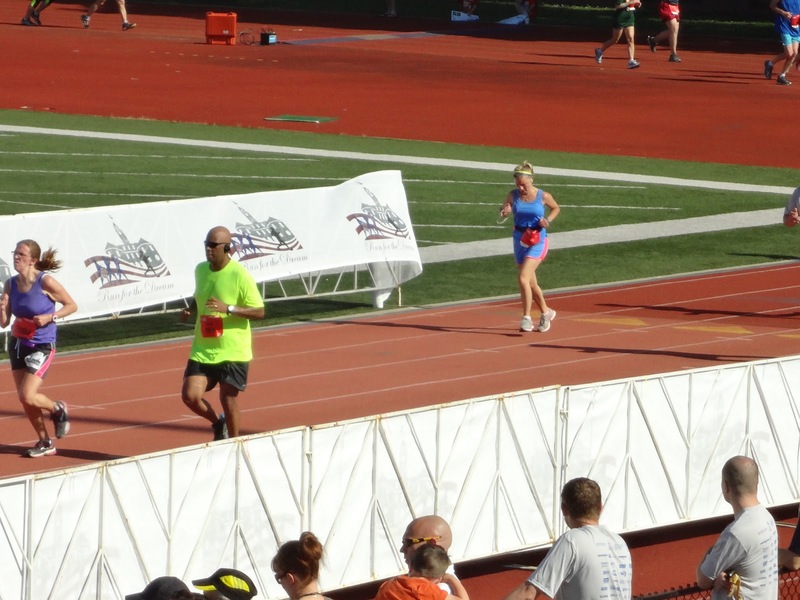 What was the slowest marathon time? ….etc. Of course I don’t remember any of the answers although I do remember that the slowest time was made by a guy wearing a full scuba gear outfit. I’m not really sure why someone would want to run in that. I enjoyed seeing Jeff Galloway talk at the start of the film, but he wasn’t a main part of it ( I didn’t think that he would be) But he was wearing his Run Disney hat!! I learned a lot about the history of the marathon like how woman were not allowed to compete and the distance for a marathon wasn’t always 26.2 miles. I appreciate that we got to follow the journey of non-English speaking folks, but I didn’t particularly like all the sub headings. Your mind wants to watch what is going on in the film, but your eyes needed to read what the people were saying. If you didn’t pay close attention you could miss something. More than 50% of the film was sub headings. It was nice to see that these runners are just as nervous and get race day jitters like everyone else. Some were running their first marathon and some had ran multiple marathons before this one. Even these athletes struggled. One runner, who ran multiple marathons before this one, got to mile 20 and couldn’t complete it. The lady from California set out to qualify for the Boston Marathon. Her dad would call her after every race and ask if she made it and she would say “no, not this time”. Her father was diagnosed with stage four pancreatic cancer. Two weeks after his death, she ran her next race and that is when she qualified! She now runs to raise awareness for pancreatic cancer. The teacher /coach from New Jersey had a loss in his life as well. He lost his oldest son to a drug addiction. 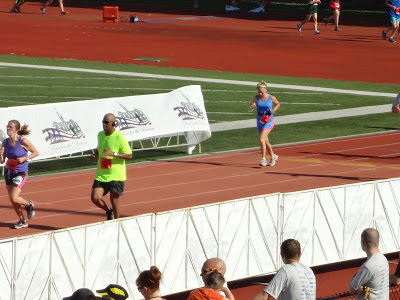 He tells his story about how running helps him in his personal life as well. This movie showed how people from different parts of the world run for different reason and what completing a marathon means to them. Some are running to raise awareness for a cause or help raise money, some are running for personal achievement, some are running for their health, and some are running just because they can! I did not see Spirit of the Marathon (Chicago) but I am hoping to be able to see it at sometime. If you saw either of the Spirit of the Marathon movies, what did you think of them? have a 10K time to submit if I didn’t want to be put in the last corral. I’ve done plenty of smaller races, 5k, 7K, and 8K, but never a 10K. The only 10k I knew about was the Wicked 10K in VA Beach, so I planned to run that in October and submit that time to Disney. I figured that would give me all summer to work my way up to that distance. As luck would have it, I found out about a local 10K on June 8th. Since Disney Princess registration opened a few days later I thought it was perfect timing. I did my first 10K training run earlier that week ( in the rain) and clocked myself at 1:09. That time was good enough for me so I signed myself up for the 10K trail run. Before I signed up, I wanted to see this trail I would be running on, so I took a bike ride around it. It definitely was not like the trails I normally run. It was very narrow, it was very wooded, and was very muddy. But I thought I could do it. If it was a hot day, it would definitely be a much cooler run because of all the shade. Later I found out that the trail I rode bike on was only the 5K. I found a map for the 10K route and my mom and I went back on Friday to check it out. Fortunately the race director was at the park while we were there and he showed me where the race would start. I was shocked when I saw the bank we had to climb up just to get to the start. We literally had to give each other a hand getting up that dirt incline. The arrows were already spray painted on the route, so we just followed that ( we walked the route). In addition to muddy and narrow paths, there were, rocks and tree limbs to avoid, and slippery wooden planks and boardwalks to contend with. Not to mention lots of inclines and declines. After seeing this race route I was starting to get hesitant. It didn’t look like something I was ready to endure at this point. To me, this looked more like an extreme trail run. To make matters worse it was suppose to rain on race day. I can only imagine even more mud and me wiping out as I run down one of the inclines. Well, race day came and I decided I would go through with. When we got to the park there were many more participants than I was expecting for a local race. Half were doing the 5K and half the 10K and we all started at the same place and time. Before we even got to the start line, the girl right behind me wipeout and fell on her bottom on the wooden planks. That made me even more cautious on this run. This is not me, but I wanted to show one of the inclines along the course. 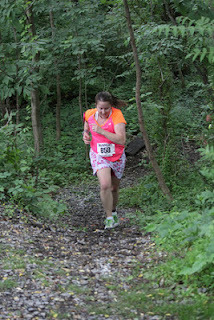 Me crossing the finish line. Have you ever felt hesitant about a race you've already signed up for? *EDIT: Since this race I was able to run a road race and I got my 10K time down to under an hour. That is the time I submitted to Disney for Corral placement. The Cinderella Pact: A Great Summer Read! One day I went to my local library to get a new book to read. I naturally head to the “S” isle to look for a Danielle Steel novel. I browse through the shelf; “Sisters” read it, “Granny Dan” read it, “Full Circle” read it, “The House on Hope Street” read it. There wasn’t much on the shelf that I hadn’t read so I browsed a little further down the shelf. 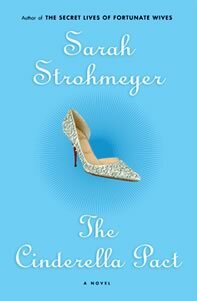 Being a Disney lover there was one title that jumped out at me,“The Cinderella Pact” by Sarah Strohmeyer. I admit that I am one the does judge a book by its cover. I don’t read the back cover because I want to be surprised at what happens. This book had a glittery blue cover and a sparkly shoe on it, so this is the one I picked! I don’t want to give too much of the story away but here is the short and sweet of it. The protagonist, Nola Delvin, is an over weight woman who creates an alter ego through her written words. Her thin, stylish, British alter ego becomes very popular. So popular that she is offered movie deals, TV appearance, and live interviews. Nola needs to find away to pull this off without revealing that she is the overweight diva behind the words of the thin young lady she's created! 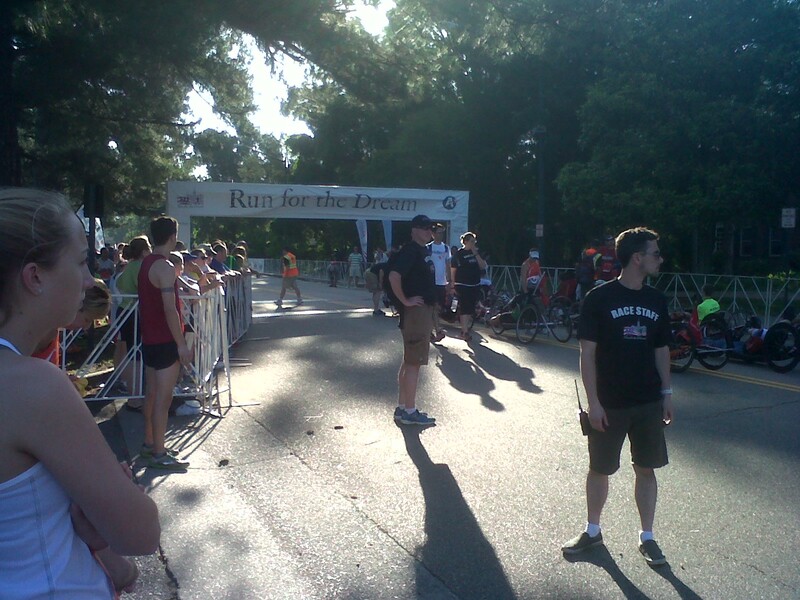 On Saturday June 1, I ran the Run For The Dream 8K with both of my parents. When I woke up that morning it had to be 90 degrees outside already. It was so hot! Prior to the race we had got e-mails and FB updates from the Event Director Kelly letting us know of the heat and that this may not be a race that we would PR in. Since this was a patriotic themed race, I knew I wanted to wear some combination of red or blue. I originally was going to wear a red or blue running skirt that had silver stars on it but really thought it might be too hot since I would have to wear shorts underneath it anyway. I decided to just wear this blue running outfit which matched my new Boston Strong Sweaty band. We had rooms at the Woodlands Resort, so we only had a short walk to the runner shuttle bus which was nice. This was the starting line of the race. The Race Director ( who was also the Race Director for Boston) gave an opening speech which even brought tears to a few eyes. 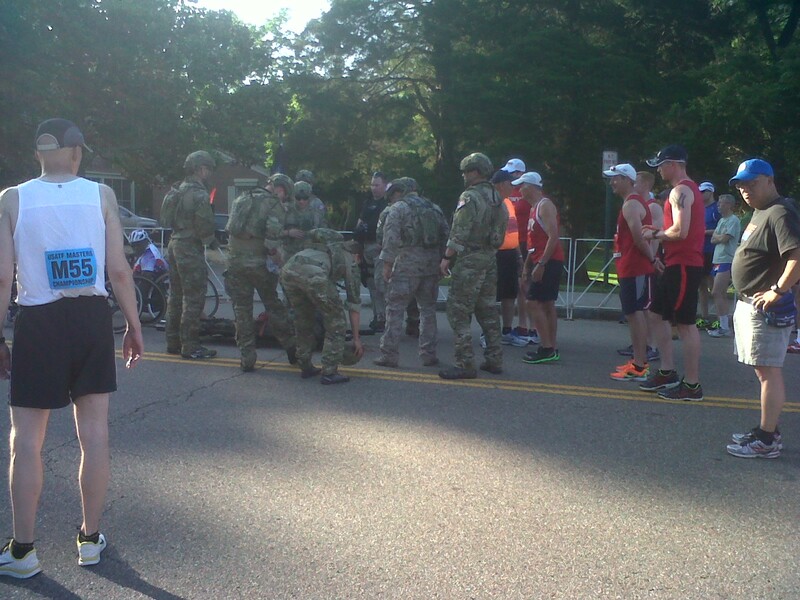 These soldiers ran the entire race while carrying a gurny ( with a dummy on it) to represent a wounded warrior. 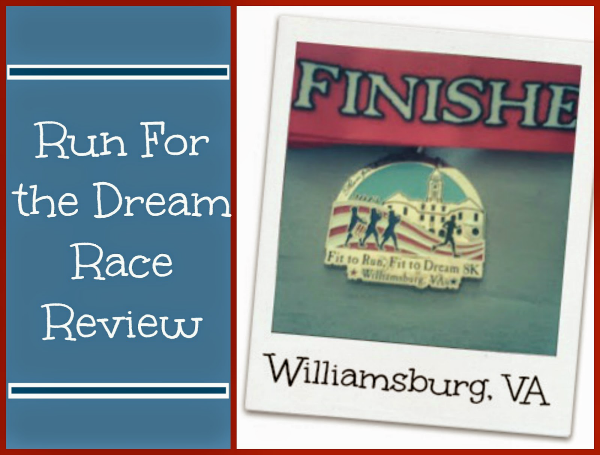 The race started out on a residential street and then through the Colonial Williamsburg area. 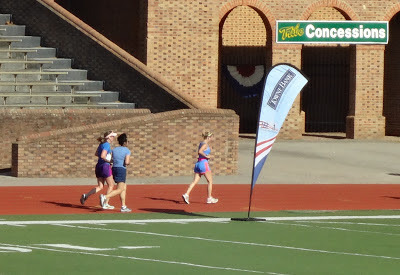 We then ran through Merchant Square and then headed towards the College of William and Mary. By the time we got here I really thought we were headed to the stadium to the finish line, but I was very wrong. We probably had about another half mile yet to go ( Maybe a bit more. It was hard to judge because the course was curving so much). My plan was to run the entire race and I had up until this point. I slowed my pace down to a really light jog-walk but then I couldn't do it any more. I was literally exhausted. I admit I did walk a little bit at this point. I think it was the combination of inclines and heat that really started to get to me. Normally I can run 5 miles and not need a drink till the end but during this race, I could have used like 4 hydration stops instead of only the two that were provided. Finally I had made it to the stadium track! This would be the time that I would normally pick up the pace. Normally during a race I pick a runner that is running ahead of me that I keep my eye on and then try to pass them as I head to the finish. 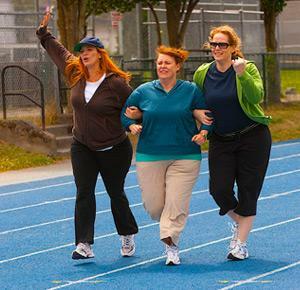 But during this race I couldn't even think about picking out a person. All I kept thinking about was just getting myself across that finish line. Did I mention how hot it was? Heading towards the finish line. Apparently I did pass a few people! Regardless of how miserable I was that last little bit of the way, I was happy with my time of 51:22. 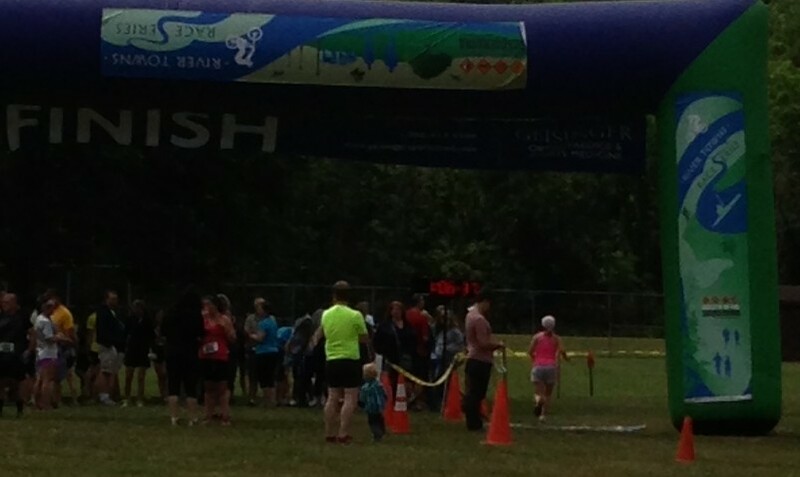 As soon as I crossed the finish line, I was presented with my medal, and then promptly found the water station. I poured a whole bottle of water on myself (something I never do and wondered why others would do that). Now I know why people do it and I was completely dry again one minute later. My parents and I all finished with in seconds of each other. We took a minute to cool down in the tent before my husband found us for the obligatory post race photos. We then made our way down to the Sunken Gardens for the post race party. Here is how I rated this race. Race Expo: B Organization was great and people were friendly, but was hoping for more vendors and would have like to sign up for some other races there too. Race Course: B+ I wasn't expecting as many inclines and the changes in terrain. I ran on road, sand and gravel, grass, cobblestone, and spongy track. Since it was so hot, I think there should have been another water stop at mile 4. I know there was entertainment on the course with groups playing instruments, but I didn't really pay attention cause I was listening to my own music. However, I could hear the ROTC students as they cheered people on. I know a few of them were speaking right to me when they saw me struggling and that help motivate me. Race Goodies: A+ We got a great medal, a race bag, race shirt ( which I even wore later that weekend back at the resort), admission tickets to Colonial Williamsburg and Busch Gardens. Post Race Bash: A This was a great way to relax and meet other runners. Good sandwiches and plenty to drink. They also had race results up already for us to see. The next day my mom and I went back downtown to cheer on those that were running the Half Marathon. The weather seemed to be a little cooler than the day before( although we were spectating from a shady spot) but it was still too hot to be running none the less. Has the weather ever effected how you've run one of your races?